Many will look at the screenshots and buy this game hoping for some quick thoughless action in the vein of Medal of Honor or Serious Sam, but these people are wrong big time. 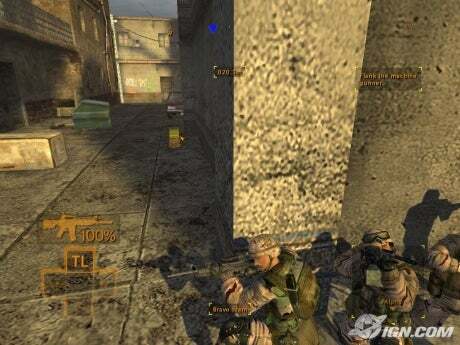 Full Spectrum Warrior is THQ\'s newest Army sim that is based upon a real training program for the U.S. Army. This means you move slowly, think every second of the game, and only shoot when you have a clear shot. It\'s like playing a textbook it\'s so exact. Good on the whole, the character models are nice and detailed but their animation is a little robotic. Another nice feature this game has is the shaky cam. The shaky cam has had a long history in films, from the 1982 bloodbath \'Evil Dead\' to this year\'s \'Bourne Suprmecy\', but this camera angle has never apearred in a game untill now. When the troops run to their destinations, the camera tilts and bobs as if your running with them. That\'s a nice touch. I give the graphics a B+. One of the game\'s strong points. The gunshots and grenade explosions are very, very real, and if you have surround sound, it may sound like you\'re in the battle. The chatter between the troops is hilarious, but at the same time sobering. I love the sound. A is what it gets. The controls are flawless but the game play is what will divide people. As I stated before, this is a living text book. This is evident from the lengthy MOUT training missions. Once thoses are over, you\'re in for a slow ride that is very intense. Another thing that I like about the game, but many won\'t, is the fact you don\'t press a button to fire a round. You simply give the command to a fire squad and they do it. This is a game of given commands, not taking them. The controls work excentlly, dare I say the best in a while. Overall this catergory gets a B+. The game is a pretty strong rated \'Mature\'. The game, of course, is very violent and bloody, but it\'s not over the top. When a character is shot, a spurt of blood hits the camera, and when a character is killed the game goes into slow motion as they hit the dirt face first, also with blood. The language the troops use is realistic for the situation they\'re in. Though they mutter the \'F\' word dozens of times, it makes sense and isn\'t grotesquely abused. I give it a D.
I enjoyed this game, but many of you won\'t. Some may complain that its to tactical, and makes Tom Clancy games seem like an arcade shooter. I agree with these people; at times, this game is dauntingly hard, and just fusturating at others. But if you have patience, this may just be the game for you. I give Full Spectrum Warrior an A-.